This page contains some of our favorite resources for ministry in small places (with some brief comments on each one). One of the best things about the recent resurgence of interest in small place ministry is the increasing availability of articles, books, websites, and videos intended to equip and encourage those in small towns and rural areas. Below, you’ll see some of the resources we think are particularly insightful and important. These have helped us the most. A helpful, honest, and important article that started many people thinking about the vast heartland of America and the need for ministry in the small places. An important article for helping to recognize the common disdain of the broader culture for the small places. Keller shows that the gospel isn’t meant to be merely the content of our speech, but also the contour of our lives. The emphasis on gospel-shaped living and thinking is very helpful in beginning to develop a ‘theological vision’ for ministry in small places. An insightful interview with writer and Acts 29 rural church planter John Hindley. Hindley planted a church in Manchester, England and then moved to rural Norfolk to plant another. In this interview, he explains why, and what he’s learned. Drawing on original research (including personal interviews) and some of the current literature, Rob Foster helpfully examines the recent resurgence of interest in small-town and rural ministry. This book became a run-away New York Times bestseller, and with good reason. J.D. Vance explores the crisis of poor, white America by telling his own story of growing up in the Rust Belt of Ohio and an Appalachian town in Kentucky. We’ve got to include at least one Wendell Berry book here! Berry’s many works of fiction and non-fiction explore themes of community, identity, memory, and the land. Berry cherishes an affection for small places that resists sentimentalism and recognizes the ever-present challenges. Two sociologists who moved to Iowa in order to understand the brain drain of young people away from rural areas offer an illuminating account of a major problem for rural America. A moving account of the life of Tom Carson, a little-known Canadian pastor who labored for years in the Eastern Township region of Quebec. Written by Tom’s well-known son, Don Carson, this is the account of an ordinary pastor greatly used by God. An extremely helpful and clearly written study of small-town America, based on interviews and analysis by a leading Princeton sociologist. An empassioned plea not to forget the small places. Written by a highly successful small-town church planter. A short, helpful call to live all of life on mission, including life in small towns. A major work of historical and biblical scholarship that makes for challenging and riveting reading. Robinson tackles (and effectively critiques) the prevailing scholarly consensus that early Christianity was an almost exclusively urban religion for the first three hundred years. This monograph is demanding, but very important. A beautifully-written, sharply-observed, nuanced, and theologically informed book on rural/small-town ministry. Roth focuses on the various disciplines required for effective rural ministry and makes the case that the Church needs the rural church in order to truly be the Church. The famous poet left behind prestigious careers at Cambridge University and in Parliament to become a country pastor. In this 17th-century work, he encouraged and exhorted other rural pastors. What comes through most clearly is Herbert’s conviction of the importance and value of this work, and his love for country people. Perhaps the most relentlessly theological book on rural ministry we’ve read (that’s a compliment!). It’s written by an Englishman, and therefore focuses mainly on the English countryside. Gibson discusses the centrality of community in a rural context and focuses on the ways in which Christians can live from their shared experience of the Eucharist in order to deepen and bless their communities. There’s lots to learn here, even though we don’t agree with everything. Reflecting careful research and a life-time of commitment to rural ministry, and written with clarity and passion, Glenn Daman’s The Forgotten Church occupies an important place in the recent literature on small-town and rural ministry. It provides an informative and inspiring call to remember what has been largely forgotten. There are some helpful resources on this page. The RMI also sponsors an annual Rural Matters conference (the first was held in 2017). Be encouraged through stories of God’s work in rural areas. For more on the ministry of Village Missions, check out this TGC article. This site contains some good resources, including video from past conferences on small-town ministry. Small-Town Jesus. Information on upcoming STJ events and other small-town ministry resources. Our own David Pinckney is the co-director of this new initiative that focuses on planting churches in small places around the world. An interview with Collin Hansen and Stephen Witmer where they discuss Robert Wuthnow's book and ministry in rural America. 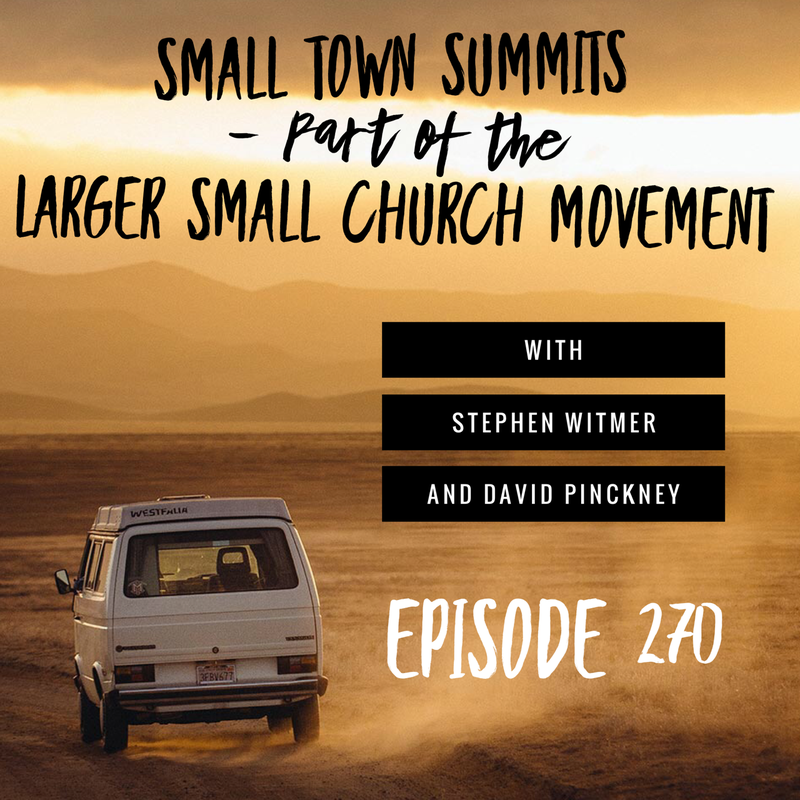 An interview with David Pinckney and Stephen Witmer on the 200 Churches Podcast. This is a great word from Jared Wilson about the crucial need for small place ministry. Here’s a really helpful Gospel Coalition conversation with Collin Hansen, Stephen Um, and Jared Wilson about urban and rural ministry. This is an excellent example of how those called to urban ministry and those called to rural ministry can support one another in gospel work.